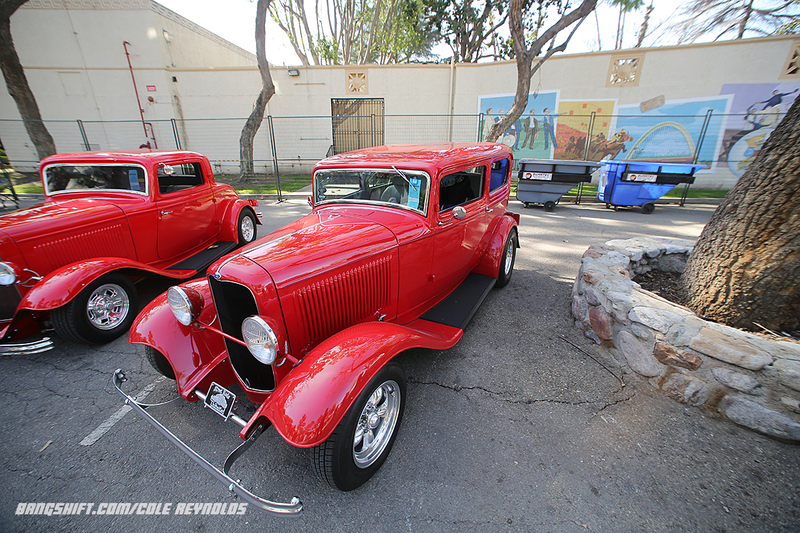 Our Grand National Roadster Show Photo Coverage Is Nowhere Near Done! (Photos by Cole Reynolds) 2019 marks the 70th anniversary of the famed Grand National Roadster Show at the Fairplex in Pomona, home of the NHRA Winternationals and World Finals. Every year, thousands of hot rods, customs, street rods, race cars, muscle cars, street machines, trucks, lowriders, and more, stuff the Fairplex in Pomona to the rafters. But while all those cars are fun to look at, and will make up a big portion of the fun you have on site, everyone is talking about the Contenders for the 2019 America’s Most Beautiful Roadster Trophy. It’s a 10 foot tall behemoth that is one of the most highly coveted trophies in custom car building. This year there are 14 Contenders for the famed AMBR Trophy and they are all below. Besides the single spotlight photos you’ll see below, there are also lots more in a gallery at the bottom of the page. Just click on any one of those photos and then use the arrows to navigate through the slideshow and check them all out. Thankfully the weather this year is better than it has been in the past few years and that means huge lines of cars and trucks coming in for the Saturday cruise and halls at the Fairplex in Pomona packed to the rafters with hot rods, customs, race cars, and so much more. Of course we’ve also got photos of all the Contenders for America’s Most Beautiful Roadster, the most coveted trophy at the event, and one of the most coveted car show trophies in the world period. The Grand National Roadster Show, often referred to as the Oakland Roadster Show in the past, started in Northern California and migrated here to Pomona several years ago now. The crowds, the stories, and the cars on display get bigger and cooler each and every year. But no matter what it is that you like to see, there is something here for everyone. We’re talking about a variety like none other. And did we mention that every famous builder and car owner is on site as well? The Grand National Roadster Show is definitely the place to see and be seen. This Wheelstanding, High Flying, Sand Buggy Action Is Almost As Cool As The Drone's Shooting It! The Odyssey: A Great Story About One Guy's Quest To Build A 1964 Mercury Marauder!